The 2011 Census recorded 455,791 households in Surrey, an increase of 5.2% since 2001. 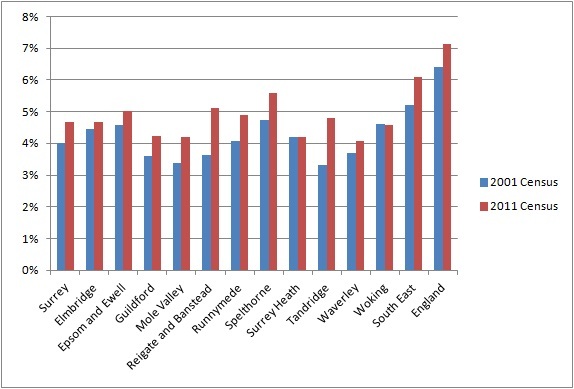 The biggest increase was in Epsom & Ewell (8.9%) and the smallest in Spelthorne (2.9%). The increase in the number of households was smaller in Surrey than in England as a whole where there was a 7.9% increase. The average household size in Surrey increased from 2.38 in 2001 to 2.43 in 2011. This reverses a long established trend of decreasing household size. Average household size increased in all districts except Mole Valley and Tandridge, with the biggest increases in Epsom & Ewell and Woking. Average household size in England as a whole remained unchanged at 2.36. More than a quarter (27.3%) of Surrey’s households comprise of one person living alone. This proportion has fallen slightly since 2001 when 28.3% of households were a single person. 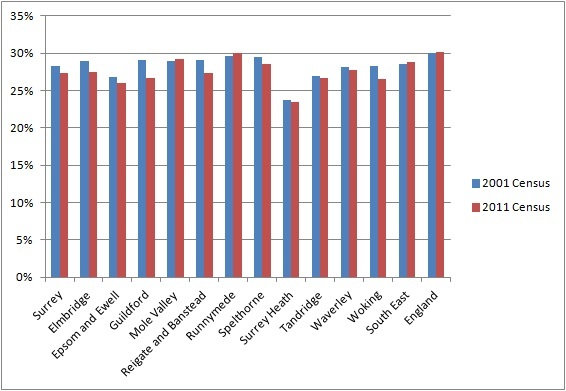 The borough with the highest percentage of one person households is Runnymede (30.1%) and the lowest is Surrey Heath (23.5%). The proportion is lower than in England as a whole where 30.2% of households contain just one person. Households comprising one person aged over 65 only account for 12.6% of households. 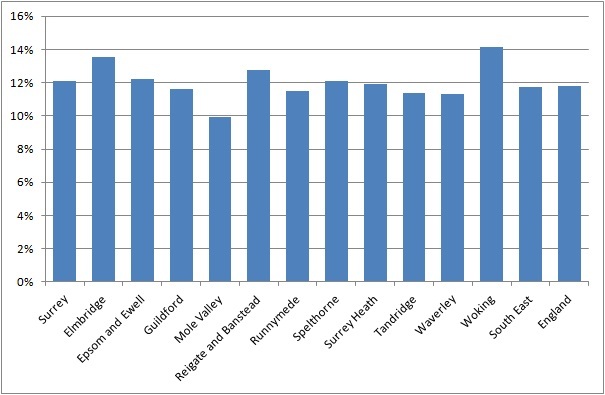 The highest proportion is in Mole Valley (14.7%) and the lowest in Surrey Heath (10.9%). The proportion of these households has fallen since 2001 when 14.3% comprised one person age 65 plus living alone. 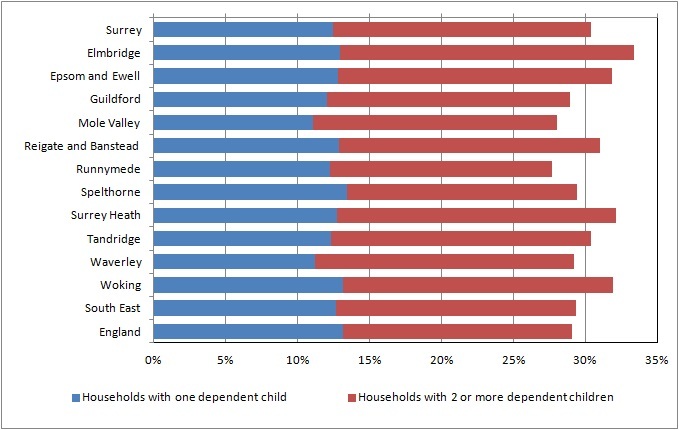 Almost a third (30.4%) of households in Surrey contain dependent children, with 18% having at least 2 dependent children. 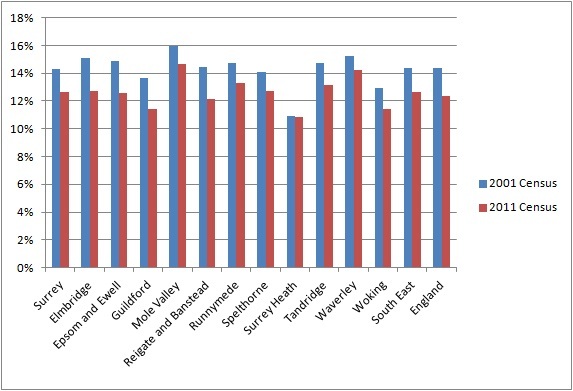 The borough with the highest proportion of households with dependent children is Elmbridge (33.4%) and the lowest is Runnymede (27.7%). The proportion is slightly higher than in England as a whole where 29.1% of households have dependent children, but nationally a higher proportion have just one child, 13.1% compared with 12.3% in Surrey. The proportion of households with dependent children has increased since 2001 when 28.9% of households contained dependent children. Nearly one in eight (12.1%) households contain children under 5. 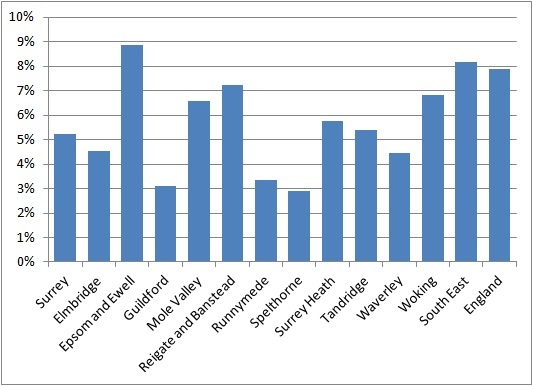 The highest proportion is in Woking (14.1%) and the lowest in Mole Valley (9.9%). The proportion is slightly higher than in 2001 when 11.3% of households contained children under 5. 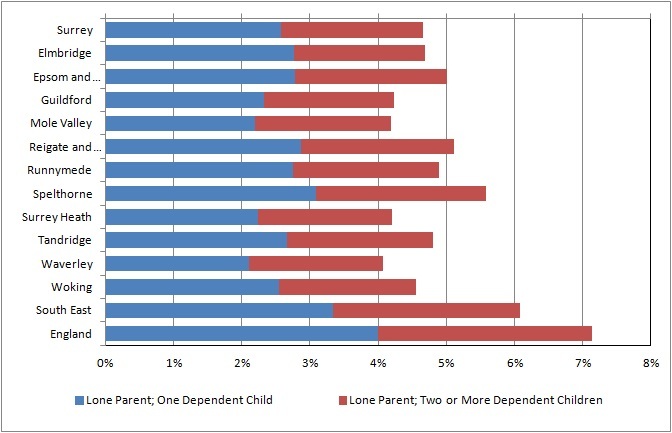 Less than one in twenty (4.7%) of households in Surrey are lone parents with dependent children. Most have only one child (2.6% of all households). The borough with the highest proportion of lone parent households is Spelthorne (5.6%) and the lowest is Waverley (4.1%). The proportion of lone parent households is lower than in England as a whole where 7.1% of households are lone parents with dependent children. The proportion of lone parent households with dependent children has increased since 2001 when they comprised 4.0% of households.